Yes, it’s official. I am a Daddy! My son Xander was born a couple of days ago. He is, like his mother, a bit impatient, and he came some four weeks early. My wife and I have been by his side at the hospital watching his little lungs improve over the last 48 hours as he sits hooked up to monitors in a Giraffe incubator with a breathing mask attached to his face, surrounded by other tiny babies in ventilators and blue light bili lamps. We are in agony not being able to hold him, but we know that he’s not fully developed yet and we’re learning to live for another week watching him through Plexiglas and occasionally holding his little hand. His favorite new activity is ripping the mask off and kicking and screaming, and so Stephanie and I are confident that her genes have won out. I am humbled, witless, stupid with joy, just plain stupid and greatly empowered after seeing my son arrive in the world. I’ll write more later, but wanted to share my absolute joy at the miracle of life with all of you. on June 18, 2011 at 1:24 pm | Reply Michael S.
Yes, it’s true. I am the mother’s father, and I saw Xander show his defiance and impatience with limits to his freedom. He flails and wails, showing a strong ego and a fearless hunger for life. A true libertarian! 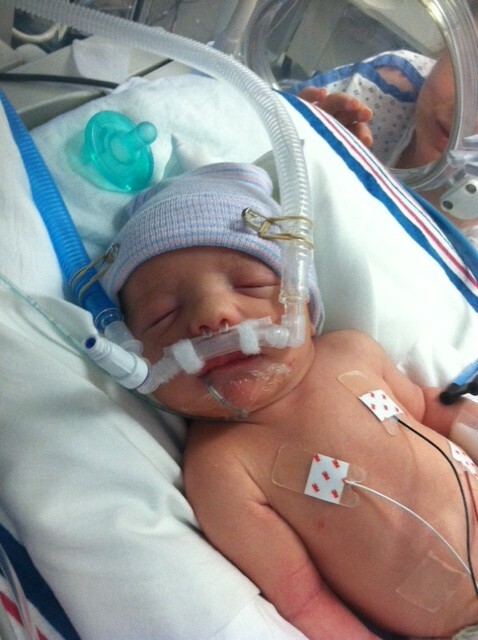 He is the cutest baby I have every seen – and the largest in the icu.